In 1927 the City of Berkeley paid George Montgomery $25,000 for the fifty acres at Elim Grove and established the Cazadero Redwood Camp for East Bay boys and girls. In 1957 it became the Berkeley Music Camp and in 1996 it was known as the Cazadero Performing Arts Camp. The Cazadero Music Camp has been the summer home to tens of thousands of young musicians since the fifties. The first season had just 60 young musicians, but the word spread quickly. By 1961, over 300 campers attended, and by 1964, the camp had grown to four 12-day sessions with close to 600 youth in attendance. For the past 61 years, Cazadero has inspired generations of young musicians, growing into one of Northern California’s most vibrant youth programs. 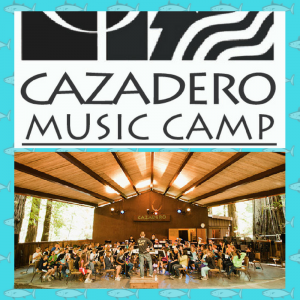 The Cazadero Music Camp serves a diverse student body of over 1,200 young musicians every year, ages 10 – 18, from across the Bay Area and beyond. The 2018 lineup includes: musical instrument building, set design, and a rich variety of song, dance, and acting. In addition, a mix of woodshop, coding, cooking, gardening, sports, and crafts allows campers to write, edit, and publish their own eBooks and blogs. Instructors create a fun and supportive environment during a special edition of BandWorks Rock ‘n’ Roll Camp, where kids learn how to rock-out in style alongside professionals. The sessions run from June 18th through August 4th, with free admission to all weekend jazz, orchestra, and concert band performances. If you’re looking for something unique and entertaining (and cheap) along the Russian River, cruise over to Cazadero for the camp’s last concerts of the summer on Sunday, July 29th and on Saturday, August 4th. Both programs start at 1:30 p.m.